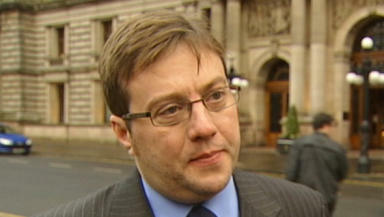 The ex-leader of Glasgow City Council steps down "with much sadness". Steven Purcell - the former leader of Scotland’s largest local authority - has resigned as a councillor. Mr Purcell’s departure from Glasgow City Council marks the end of one of the most turbulent weeks for the authority in recent years. The 37-year-old, who was one of the rising stars of the Labour Party, announced his resignation as a councillor on Friday afternoon. In a statement, his lawyers said: "Steven Purcell tendered his resignation today. He did so with much sadness but with great support from friends, family and many well-wishers from every part of the city. STV News understands forthcoming weekend newspaper reports will feature stories of contact Mr Purcell has had with police. On Tuesday, Mr Purcell shocked the council and Scottish politics when he stood down as leader. He was said to be suffering from "stress and exhaustion". It soon emerged Mr Purcell was receiving treatment at the Castle Craig Rehabilitation clinic in Peebleshire. STV News revealed yesterday that Lothian and Borders police officers were called in to search for the council leader after he disappeared on Sunday from the clinic. It was then claimed on Thursday night by the politician’s psychiatrist, Dr Florian Kaplick, that Mr Purcell had not received any treatment for a drug problem during his stay at Castle Craig. Lawyers acting on behalf of Mr Purcell have also rejected claims that Glasgow City Council chiefs were preparing to tell the public he was suffering from a "chemical dependency".